Cool grey khaki is the new black! I love my new Subaru Crosstrek! The vehicle came with rubber floor mats that are a must have for my family- 3 dogs and a kid! There are a ton of features that make this car awesome- Bluetooth connectivity, apple carplay, excellent safety rating, sunroof, unique colors, excellent gas mileage, etc. The car is comfortable and roomy as to be expected from a midsize car. I have had zero mechanical (or otherwise) issues! It is super fun and easy to drive/ maneuver/ handle whether in bad weather or winding roads on a sunny day. I love that it sits a bit higher than an average sedan but not quite as high as a truck. One of the extra features that comes with all Subarus is the Subaru community; it is a blast to be a part of. These people love there vehicles and for good reason! My vehicle is wonderful. For a 2019, I expect the best, safest, and most tech advanced, and that's what I got. Subaru exceeds my expectations of safety, functionality, and even luxury. The Crosstrek is a sporty car, but for all intents and purposes it feels luxurious and wonderful to me. It has a navigation screen that connects to the maps on my cell phone, it has seat warmers, all wheel drive, fully functional and capable safety features, and awesome sound system (particularly the bass). Overall wonderful vehicle to have purchased. I would recommend to anyone of any age, family or no family. I also travel with my dog in the vehicle and it is very comfortable for her. New 2019 Subaru crosstrek with two toned leather interior. The 2019 Subaru crosstrek is the perfect vehicle for a single driver or family. I love the comfort of the interior and the sporty look of the exterior. The crosstrek is featured with eyesight and collision warning, which were a huge plus coming from a small sedan. The limited crosstrek in pearly white comes with a two toned grey and white leather interior, sun and moonroof, and rubber floor mats. I love the hideaway feature for the trunk so that I can secure important items in my trunk area. This is the best automobile I have had the pleasure of driving. 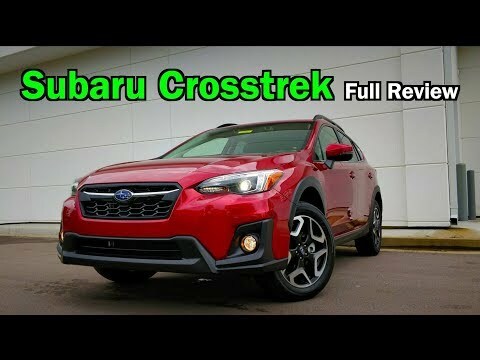 2019 Subaru Crosstrek: FULL REVIEW + DRIVE | Small Price; Big Versatility! Here&#39;s why I LOVE the 2019 Subaru Crosstrek!